The radical Muslim preacher Abu Hamza has been sentenced to life in prison by a New York court after being found guilty of supporting terrorist organizations. He was jailed for offences including efforts to launch an Al-Qaeda training camp in the US and aiding hostage takers in Yemen. Hamza, 56, appear at the US District Court in Manhattan at 1500 GMT on Friday. He was found guilty of facilitating the 1998 abduction of 16 Western tourists by providing Yemeni kidnappers with advice and a satellite phone. Four hostages – three Britons and an Australian – were killed in the operation. He was also convicted of conspiring to set up a terror training camp by sending two followers to the US state of Oregon to establish a militant training camp in 1999. Furthermore, he was found guilty of providing material support to Al-Qaeda, assisting the Taliban and sending terror recruits to Afghanistan. His lawyers said the court should take Hamza’s disabilities into account – including being blind in one eye, having had both forearms amputated, diabetes and high blood pressure – when handing down sentence. They argued he should not receive a life sentence and that Hamza should be sent to a prison medical facility instead of a maximum security prison. Hamza revealed he lost his hands in an accidental explosion two decades ago in Pakistan, where he claimed he was working as an engineer. 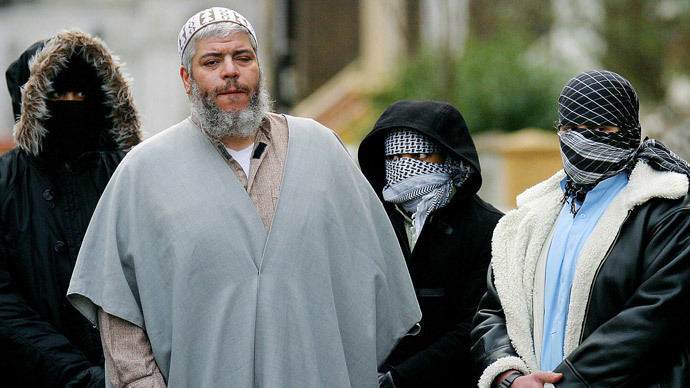 The Egyptian-born father of nine gained notoriety for encouraging violence, as he spread inflammatory messages at the London Finsbury Park Mosque, which he led, following the 9/11 attacks on the World Trade Center. The 9/11 conspirator Zacarias Moussaoui and the British would-be shoe bomber Richard Reid reportedly attended Finsbury Park Mosque, but Hamza denies ever having met them. In 2006, Hamza was jailed for seven years in Britain for soliciting murder and inciting racial hatred before his extradition in 2012 to the United States to face terror charges.